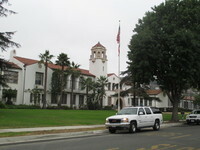 The main building of Santa Barbara Junior High School is a highly-detailed depiction of Spanish Colonial Revival architecture. Each elevation shows attention to ornamentation often found in Spanish-Moorish architecture. The one and two-story structure forms three sides of a quadrangle, with the easterly end of the front wing extending farther thatn the westerly end. The multi-purpose building construc5ed in 1963 forms part of what wold be the fourth side of the quadrangle. 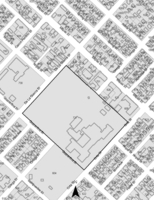 The 1937 field building or physical education building is to the northeast of the latter structure. An elaborate 70-foot tower rises from the main entrance topped by a conical tile roof and a rounded terra cotta finial. The tile roofed building makes liberal use of ceramic tile in window reveals, lunettes, divisions between windows, at the entrances, and under balconies. Many sets of windows have turned wood balusters. The main entrance features carved stone ornamentation. Designated City of Santa Barbara Landmark (03/26/1985). 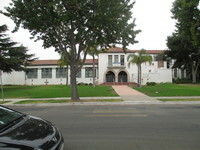 Following the 1925 earthquake, a school bond election was held in 1930 for construction of a new Junior High School. 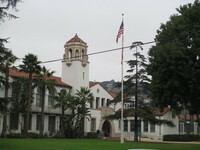 William H. Weeks, locally renowned for his designs of two other schools: Santa Barbara High and La Cumbre Junior High, was chosen to design the school in Spanish Colonial Revival style. In August 1932, a lavish dedication ceremony during Old Spanish Days Fiesta opened the new school with nearly 1,000 people in attendance.